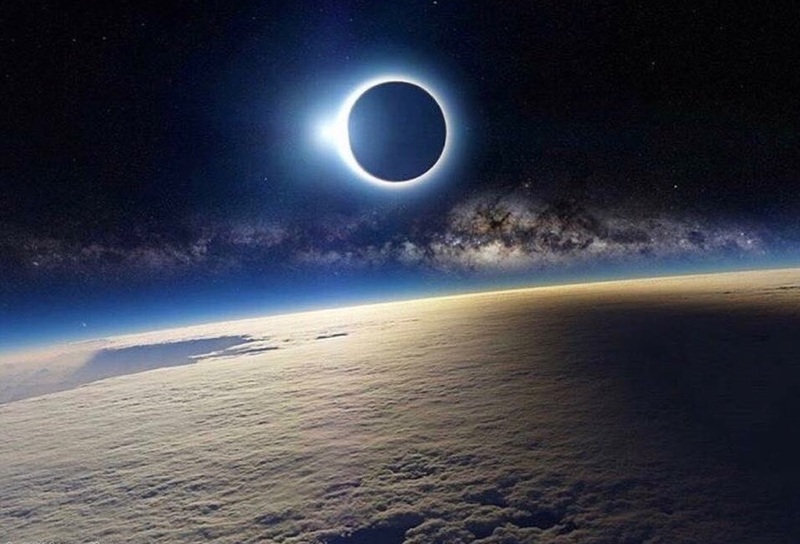 Amazing Eclipse Pictures... And Something More? Today's historic eclipse is now over. This amazing sign in the heavens crossed the United States in 1 hour and 33 minutes, beginning in the 33rd state and ending at the 33rd parallel. It occurred on the 233rd day of the year, 133 days before 2018, and happened 33 days before what might be the Great Sign of Revelation 12. Featured below are some amazing pictures from across the nation. 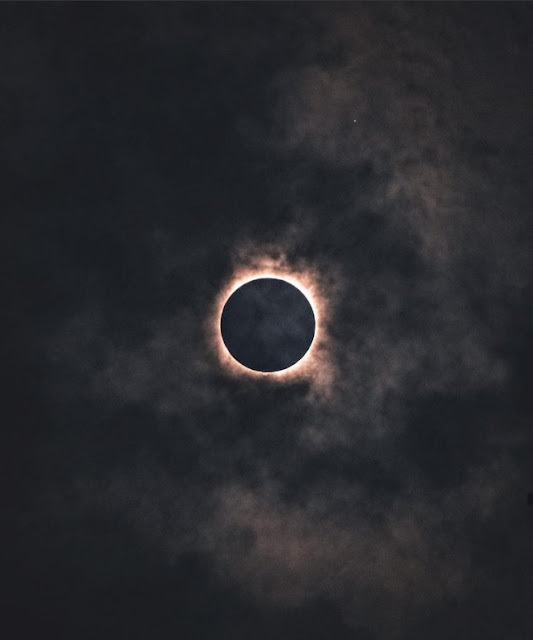 Whether in the path of totality or not, the entire nation was covered in crescent-shaped illumination, a phenomenon that only occurs during a solar eclipse. 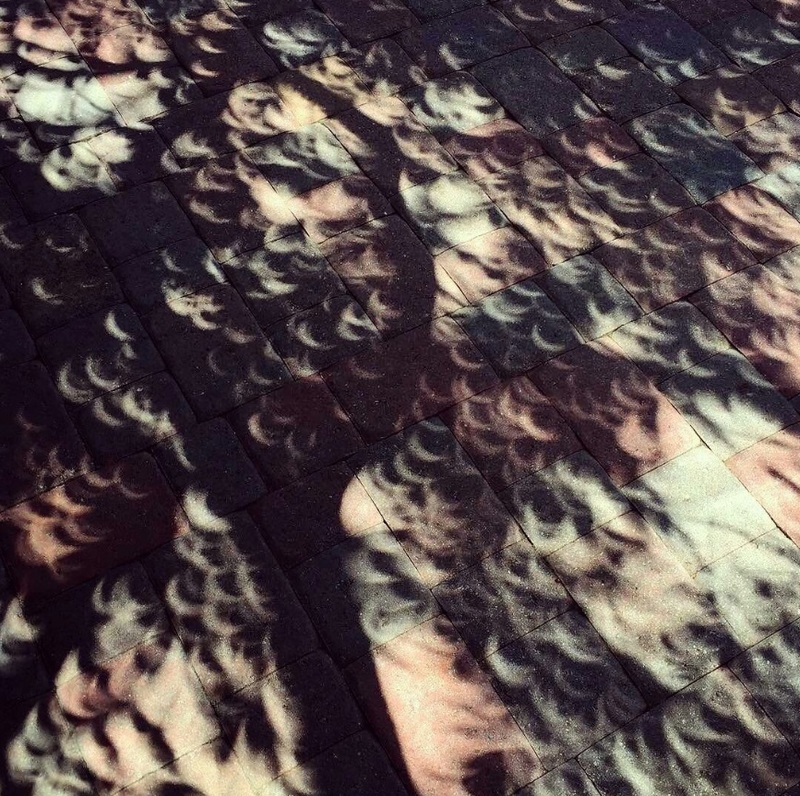 Trillions and trillions of these little shadows covered the United States. This caught my attention seeing as the Feast of Trumpets is the only biblical holy day that is marked by the sighting of the moon's waxing crescent. It is a signal that the day "no one knows the day or hour" has begun. Could these tiny crescents be a reminder that the Feast of Trumpets begins in about one month? 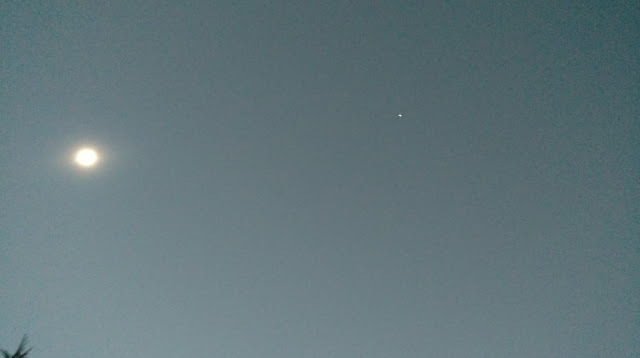 Regulus, the King Star, the brightest star in the constellation Leo, can be seen above and slightly to the right in the above photograph. This was a reminder to us all that all eyes were on one of the two constellations involved in next month's Revelation 12 Sign. The above picture is a time-lapse photograph of the eclipse over the Gateway Arch in St. Louis, Missouri. 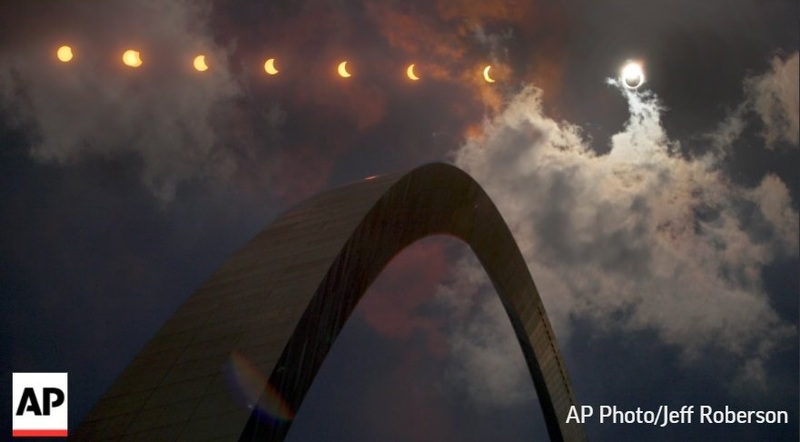 What is the elongated, crescent-shaped object below and to the left of the eclipse? A number of spectators noticed this object. Some described it as a light-blue color. Is this the same object? The picture was taken from a different angle, but the object is at about the same distance as in the previous photo. Closer investigation revealed that this object was probably a lens flare. However, the same can't be said for the previous photograph. 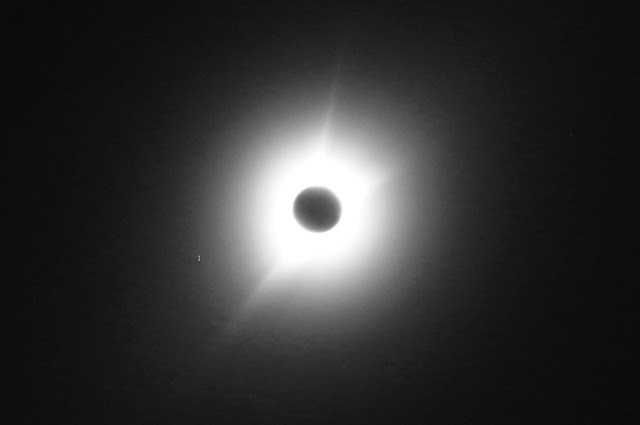 The above picture was taken shortly before totality. To the right you can see the planet Venus, which will join Mercury and Mars on September 23, 2017 to form a crown of twelve stars on the head of the constellation Virgo. Who was able to see the eclipse? Did you take any interesting photographs or see anything that piqued your interest? If you can share a link in the comments below I may include it in this post. I wasn't sure we would still be here for this eclipse a few months back, but now I'm glad that I got to see it. We continue to wait on God to send His Son, Jesus Christ for us. Hope it's soon. Maranatha! Amazing stuff, Kris! Even where I was in Texas temperatures dropped about 3-4 degrees. The sky changed from bright blue to almost a greyish-blue like you might see before a storm comes. Yes, like before a storm! When I mentioned how different the colors looked outside during the eclipse, my husband's response was that it almost looked like it does before a tornado - everything seems to take on a different hue... No totality here in NW Ohio, but pretty amazing nonetheless! The 5th picture down was what I saw here in St. Louis. It was amazing to be able to take the glasses off. At one point the space station crossed when the moon was over the sun about 25%. Yeah guys it looked as if a storm is coming and now I'm convinced it's going to start when that crescent moon appears between September 20 and 22nd. How can God make it any clearer? Shortly before the eclipse got it's fullest here in Wichita, Kansas, a hawk swooped in from the south and kind of glided over the neighborhood before leaving. I definitely believe that to be a sign as well. We only had 93% coverage here but it was still a sight to behold. In Spokane I had that same lower left light. I thought it was a sunspot of the actual eclipse as my camera ont phone still recorded more light than there was. I'll try to send a picture. About to pop a Pizza in the oven and end the 18 hour fast dedicated to the day and our Lord's Graces during these times. Here in CO, near Denver, I took the day off work and the Fam and I watched from the back deck, pinhole shoebox and a neighbor's welding goggles did the trick. Odd to have sunlight dimmed with no clouds, off-hues on the yard and trees, the semi-circle shadows on the drive, as above, and a noticeable coolness. Now the event has passed and the waiting resumes, praying for steadfastness amongst us all, Maranatha! Hey Jimboni, I contacted you on G+. Hope you got my message!! God bless. I also saw a rainbow about 5 hrs after eclipse in Illinois. Dallas, Texas. I took 3 pictures and all 3 have the object/blue light just like the one above! What is your take about that object? If you can upload them and share a link I would be curious to take a look. File Dropper is useful for that. Definitely a lens flare/reflection from the camera. I have it in a couple of the photos taken today and it is in a video as well. Moved around with my hand shaking in the video. The Blue Kachina of Hopi fame? Even here in Maine, at only 60%, you could feel the slight drop in the temp. Here in Missouri, south of St. Louis, we had a totality eclipse. It turned to a dark dusk, the cicadas and crickets were singing, the birds started chirping at sun break. During totality I could hear cheers and fireworks from close neighborhoods. I don't think a lot of people understood what this was, a warning. Same for me. My wife and I were in Villa Ridge and heard many cheers and saw fireworks in the distance. Kinda strange to be honest. While the eclipse was absolutely gorgeous and an incredible experience I couldn't shake the feeling that it was very ominous. I somehow deleted my post... This is Dallas, Texas with the same picture. I have 1 that is clear and 2 that are blurry. My son said they are flares. What I don't get is how could the flares be so similar and the pictures so alike. I will try to load the pics. Pictures #2 and 3 are definitely flares, but I can't quite tell with #1. My husband read that the international space station crossed in front of the sun during the eclipse. Could that be the object which would have been reflecting the sun? Not sure why it would be crescent shape unless it was caused by a slow shutter speed. Check out Richard Faulkner's HufPo link a few posts down. It looks like the ISS is much too small to be the crescent-shaped object. Had around 90 seconds of totality here in Nashville where I work. Looking with the naked eye when the all you could see was the very edge of the sun encircling the moon was quite amazing. I must say, in the environment where I watched it, there was a part of me that almost felt like this was anti-climatic. People enjoyed the celestial novelty, but I had no sense of any appreciation for the awesomeness of our Creator among those who were around me. Then it was over and everyone went back inside to their cubicles where the tyranny of the urgent resumed its rule over the lives of many. I cannot help but wonder if what I felt/sensed was because I was immersed amidst a crowd of people who, as best as I can tell, had absolutely no appreciation for the spiritual significance of what we were observing. I mentioned to one person how Jerusalem went dark at precisely the same time that the path of totality began in Oregon. No response of any kind. Only the Lord knows people's hearts, but it sure felt like a blanket of unbelief to me. I must say, it is patently absurd when I hear the secular astronomers refer to this God-created phenomenal sign in the heavens as nothing more than a "cosmic coincidence". Truly,as the Psalmist has written, the fool has said in heart, there is no God. "Then it was over and everyone went back inside to their cubicles where the tyranny of the urgent resumed its rule over the lives of many. I cannot help but wonder if what I felt/sensed was because I was immersed amidst a crowd of people who, as best as I can tell, had absolutely no appreciation for the spiritual significance of what we were observing." When the rebel host are kicked down from heaven and they turn up with ships, life as your co-workers know it will be forever changed. Either that will come first or the mass disappearances, but pray for them. They're victims. It is most profound that as darkness fell in Jerusalem that darkness fell in America via the eclipse. Sunset in Israel marked the beginning of a new month, the sixth month being 1st of Elul. More importantly the 40-days of Teshuva (repentance) has begun and will end on 10 Tishri (Yom Kippur). My camera caught those too here in Helena Montana. It isn't present in all of the photos (which were taken with my cellphone) It is definitely odd. A childhood friend of mine and her husband recently moved from Billings to Helena. I've been waiting to hear what they experienced! I took several photos and noticed the objects in the photo. My daughter's friend in Texas took pictures the resembled mine as well. As totality approached I noticed that it was going to occur lined-up DIRECTLY OVER the church steeple! We all gathered to take pictures and what did we find? We had all taken pictures that shown a perfect cross in light formed by the union of sun and moon! It filled the sky and reached down to the cross atop the church! I'm waiting on a copy to be sent to me from a gentleman who got a better picture of it than I.
I have seen eclipses before but none as stunning and awe inspiring as this. My wife put it best. She was simply overwhelmed. I think today we had a taste of what it may be like in one month from now. I think that picture rules out the crescent-shaped object people were seeing from being the ISS. The ISS looks tiny compared to the sun! I live in NC and I have 3 pictures with the same crescent object as well. We were blessed to be in Smith's Ferry, Idaho today to experience the eclipse. What a wonder filled experience. The sky turned an unusual color of grayish-blue as the eclipse progress with the light of the moon changing from a warm yellow to a LED like light. Very unusual. We were also surprised how much the temperature dropped as the eclipse was waxing. We also noticed the animals in the area. The dogs became quiet and then all of them laid down, as though it were evening. While the eclipse was waning, we also noticed a very large proportion of farm animals lying down in their pastures, over 80% estimate. I mentioned this because I had read it happens during an eclipse and we witnessed it. We also witnessed the brilliant "diamond ring" of the eclipse. It was quite the experience! Nice video! Thank you for sharing. Outstanding video! Thanks for sharing it! The Big Ben had its last 12 booms on the day of the eclipse. It will not boom for 4 years. The grand monumental identity came to a stop. Wow hope daily crow is all over that. The maker of Big Ben (Elizabeth tower) called it the "prince of time keepers". Wowsers !!! Btw, that other object next to the sun was Mercury. You can use sky view app, to check it out before things move. Great articles love the website. I have a question about the Rev 12 sign. I didn't know where to put it so I am putting it here. If the great sign of v1-2 is a constellation how can a constellation flee to the wilderness in verse Rev 12:6? That's a good question. I think it is because Revelation 12 is also a narrative describing earthly things. In that instance, Israel fleeing into the wilderness. There are signs and then there is the reality. Signs point to the reality. I love it that God included the "diamond ring" as part of the eclipse . . . What the bride wears as she prepares for the wedding . . .
As always I pray for the patience and ability to help these people see and that they might open their eyes and hearts and even receive some God-given discernment. Here's a video I made of our experience chasing and watching the eclipse. It was an incredible sight to behold! "When you see all these things, look up to heaven for your redemption is drawing near!" My phone captured a similar scene but slightly earlier and not as pronounced. Special thanks to Pastor Blinson of Cross Roads Baptist Church for allowing us to share this special moment with them! Glory to God in the Highest!! There are many dissecting our eclipse noting it may NOT have been the moon after all. 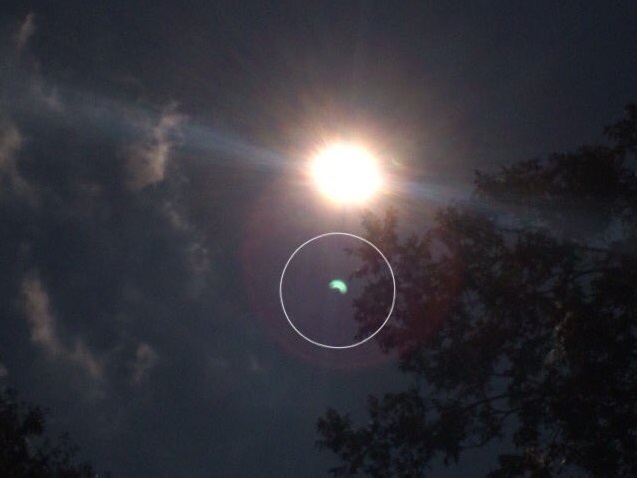 Has this all been a hoax or was the circular object something else, like a hologram? Why was there heavy chem trailing in the skies above? Was this a final test run of Project Blue Beam and HAARP prior to their pinnacle event? Apparently, it should have been a lot darker and much cooler than it was in the path of totality. In some places the eclipse happened an entire earlier than it was "scheduled" to.. You decide. I took a picture that captured the light blue crescent shape in the lower right hand portion of the photo with the sun high up in the middle. There is no way that was lens flare. I've seen that in my other photos but it's always located right next to the sun. We as Christians know that solar eclipses are a warning to the gentiles whereas lunar eclipses are a warning to the Jews. One thing that stuck me was when the diamond ring happened. It was as if we were being shown a wedding ring for a soon coming wedding.